This book examines the relationship between women and terrorist activities in the post-World War II era. 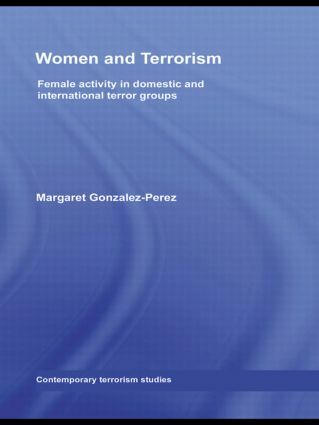 Utilizing comparative research into 26 terrorist organizations world-wide, the work identifies a dichotomy whereby women are significantly more active in domestic terrorist organizations than in international groups. Women and Terrorism argues that domestic terrorist organisations employ revolution, secession, or other means to change internal aspects of the state and the social and economic structure it maintains. This offers the possibility of change in women’s societal status; therefore, women are drawn to domestic terrorist organizations in much higher proportions and choose a much greater level of activity, entering the ranks of combat, leadership, and policymaking. By contrast, international terrorist groups oppose outside forces, such as imperialism, capitalism, Western culture, or other more nebulous concepts. Gonzalez-Perez argues that female lack of participation in these activities reflects the fact that women will be relegated to the status quo, regardless of the success or failure of the international terrorist movement.